Note: The VIP Tables include your event tickets. You do NOT have to buy event tickets on top of the vip table. Also, bottles are already included in the table price. You are NOT buying bottles. Yes, it’s that great of a deal! Seating for Two: $450 (includes 2 VIP tickets, 1 Champagne Bottle) – “Couples Champagne Table” sell fast! Note: Custom packages and complete buyout of VIP Table areas are available for groups of various sizes. 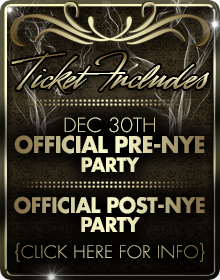 For more information, please e-mail ChicagoNewYearsParty@gmail.com. Tables are very limited and will sell out ~ Hurry and Reserve Now. If tables are sold out, please e-mail us and we will see if it is possible to add more.